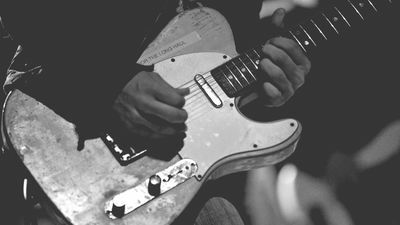 While the pentatonic scale is an incredibly useful tool for guitar players of the rock and blues variety, the standard method of learning the scale in five box shapes doesn’t do a lot to distinguish you from the next guy. So, what can you do to make your pentatonic playing stand out from the crowd? Well, you’ll be pleased to know that this isn’t another of those breaking out of scale boxes lessons; in fact, in this lesson I’m going to encourage you to stay well-within the confines of those beloved boxes, while avoiding all those cliche pentatonic licks. Play through the following sequence, which is our familiar minor pentatonic box one in A but played in fourths; that is, you don’t play it in the regular linear order, you play it in intervals of a fourth (with a major third interval thrown in between the C and E notes). To execute this run correctly, you’ll need to employ the finger roll technique as you’re going to use one finger to play both notes when they fall on the same fret. Once you’ve got this going smoothly, you’ll want to start playing with the order, mixing it up and coming up with your own licks and runs. What you can also do is apply the same logic to the other four minor pentatonic boxes, or any scale for that matter. You’ll be pleased to know that we can also do this with the interval of a fifth, and rip through the scale in much the same way as we did with the fourths. Here’s your basic pattern in A minor pentatonic, and once you’ve got it down, start coming up with your own stuff. Lastly, try playing a minor pentatonic scale in sevenths. I love this sound, and as you can hear, we’re now a long way from cliché blues and rock pentatonic licks and almost into fusion land. With sevenths we have to skip a string as we play through the scale. I’d recommend using hybrid picking for this (play the upper notes with your middle finger) to avoid the clunky pick movement and potential for all manner of unwanted noises. 1. Once you’ve got the basic idea down, come up with your own stuff. 2. Repeat the exercise with the other four pentatonic box patterns.